In many parts of the world, it's a tradition to serve seafood at Christmas. The most classic is the Italian Feast of the Seven Fishes, which—as the name suggests—involves a spread of seven seafood dishes. Whether you're inspired by the cuisine of Italy, happen to live by the coast, or just enjoy ingredients from the sea, this elegant Christmas dinner menu is a fantastic way to celebrate the holiday with friends and family. Get inspired by ideas for every course—including appetizers, salads, mains, and desserts—that work whether you're hosting an intimate family dinner or a larger celebration. You may just make this your new annual Christmas dinner tradition! 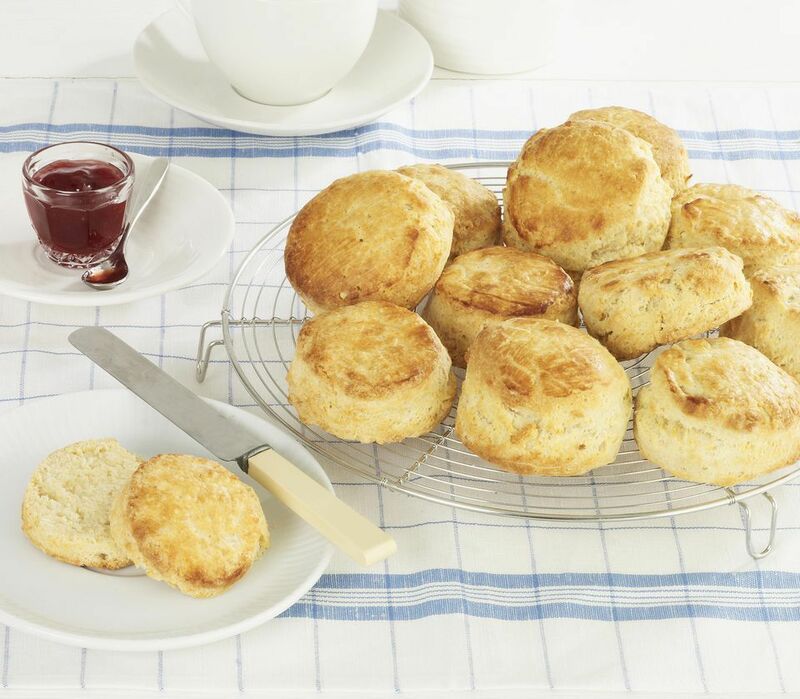 Flaky biscuits are fabulous for dipping into seafood chowders and soaking up sauces. This easy recipe for classic buttery biscuits is just about foolproof—you can even make a batch in just over 30 minutes. Bruschetta—a popular Italian appetizer made from grilled bread drizzled with olive oil and rubbed with garlic—makes a great party starter. This wildly delicious buttery garlic crab bruschetta features plenty of garlic, butter, and sweet, succulent crabmeat. Easy butter and herb baked oysters are a fancy appetizer that's sure to impress. A little lemon juice adds zing to fresh, briny bivalves in the shell, and the buttery herb crumb topping makes these starters restaurant-worthy. These bite-sized stuffed mushrooms with clams call for adding minced clams to the classic combo of breadcrumbs, parsley, and garlic stuffing. They're cute, delicious, and perfect for wowing your holiday guests! Fried calamari is one of the tastiest and most popular of Italian seafood appetizers. In an impressive first course, rings of tender squid are battered, fried until golden and crispy, and served with sea salt and lemon wedges for squeezing. This bright, refreshing fennel, grapefruit and arugula salad has a unique mix of flavors and textures that pair exceptionally well with seafood. Juicy, sweet-tart grapefruit is balanced by peppery arugula, creamy avocado, and crisp, aromatic fennel, all tossed in a super simple olive oil and grapefruit juice dressing. Dark, leafy greens are wonderful for enjoying in winter salads. In this simple, yet elegant kale salad with grated cheese and lemon dressing, thinly-sliced raw kale combines with walnut and olive oils, plus Parmesan cheese for a light first course that's a great way to kick off an indulgent Christmas meal. Late fall and winter are ideal seasons for sweet and juicy pears, and this restaurant-worthy pear and greens salad is a great way to use the fruit at its peak. You'll love the combination of tender pears, slightly bitter greens, blue cheese, and toasted walnuts in a sweet celery-seed vinaigrette. Making your own croutons can upgrade everything from salads to creamy chowders. This easy crispy parmesan croutons recipe was created to garnish a Caesar salad, but it's fantastic for finishing seafood stews, too. A rich and creamy lobster bisque is sure to earn rave reviews. The aromatic stew is a special-occasion bowl that can be served in small portions as a fancy first course at Christmas dinner. 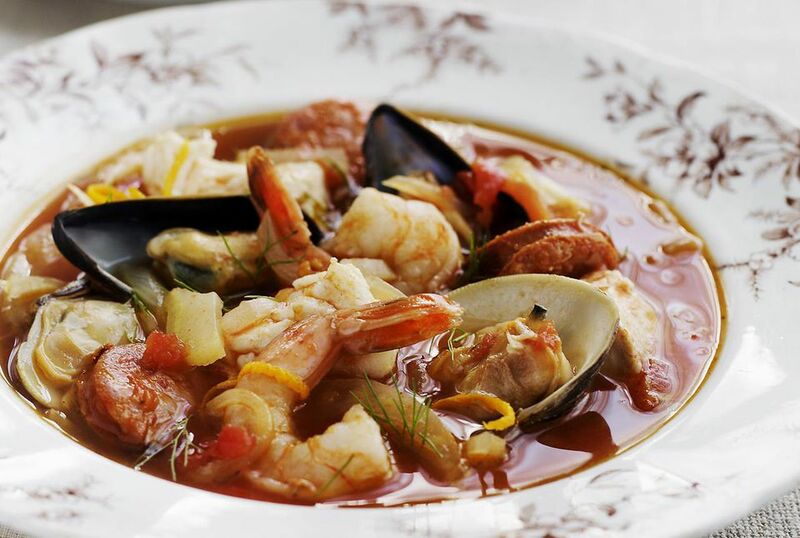 Crockpot fisherman's stew (Cioppino), a hearty Italian stew brimming with both shellfish and fish, is ideal for serving as an entree. Using your slow cooker results in tender seafood and a deep, complex broth without taking up any precious stovetop space. Wow your guests when you come out of the kitchen carrying an Italian-style whole roasted fish in herbs on a platter (just like they do at special meals in Italy!). This fish entree is surprisingly easy to make and it never fails to impress. Puff pastry-toped lobster pie with mushrooms is a special way to take a classic dish to the next level. Fancy and comforting all at once, this is definitely a show-stopping entree for your holiday table. Halibut is a meaty fish that takes on an incredible flavor when it's seared. This pan-seared halibut recipe with red wine sauce is satisfying, yet light at the same time. The sauce can be made ahead and refrigerated in an airtight container. Shrimp scampi is a beloved Italian-American dish. Fresh, garlicky shrimp in white wine sauce is as quick and easy to make as they are enticing to a crowd. Serve with hot cooked pasta for a great entree idea at your Christmas seafood dinner. Teeming with garlic and cheese, this seven-ingredient (five if you don't count salt and pepper) pasta recipe can be used as a base for shrimp scampi, or an elegant side that pairs well with roasted or pan-seared fish. Serve this pasta with garlic and cheese with a nice green salad. Broccoli rabe, also called rapini, takes on a deeper flavor and a pleasantly crispy texture when roasted. Serve the tender, browned stalks as a side dish for cooked fish dishes. You can also sprinkle this roasted broccoli rabe atop seafood chowders and soups for added texture. Roasted parsnips have a naturally sweet flavor that is welcome at a holiday dinner. A simple glaze made with maple syrup gives this nutritious vegetable side dish a tempting golden brown color. Sesame seeds are sprinkled over the top of these maple glazed roast parsnips for the last five minutes of baking, for added crunch and visual interest. In this classic no-cook tiramisu dessert, layers of sherry-soaked sponge cake, custard sauce, and fruit-flavored gelatin are topped with whipped cream. It's the perfect sweet ending to an Italian-inspired seafood feast. Citrus is an ideal complement to seafood and this easy orange liqueur cake is packed with fruity, boozy flavor and finished with a delectable buttery orange glaze.